My car bumps up a bridlepath, pushing past overgrown ferns. I open one gate after another, pass a crowd of sheep, then arrive at the top of a hill. There is a cluster of buildings, a ruined wall, a very old caravan and a church. Brother Harold Palmer, whose place this is, is nowhere to be seen – until I look in the church, and find him sitting there completely still, as if transfixed. Brother Harold has lived on this hill in Northumberland since 1971; first in a caravan, then in a house he built with the help of friends. 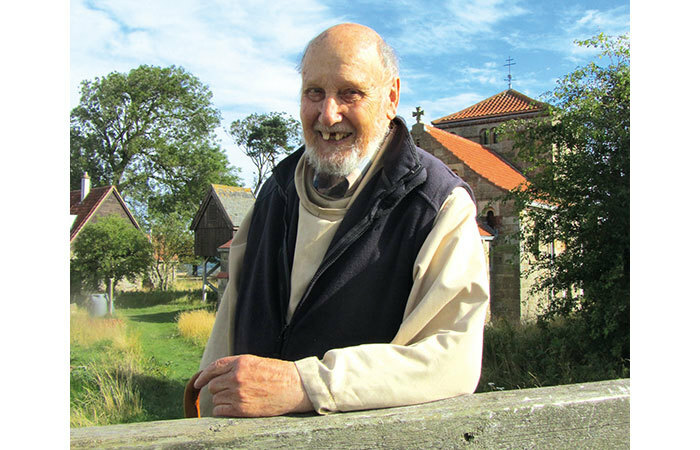 In the decades since then, he has raised enough money to build a church and four monastic cells, designed by Harold with architects Ralph Pattison and John Sanders. The church, built by two builders over seven years, won a RIBA award in 2015. Built in Romanesque style, the church looks like it could be a thousand years old. The view from the cells is breathtaking: a patchwork of green fields all the way to Scotland. After a minute or two of silence, Harold gets up abruptly to say hello. He has a missing tooth, and leans on a stick, but his eyes sparkle. ‘Have you come to see me?’ he asks, sounding amazed. He shows me my cell, where I will stay the night. There is a paraffin lamp (electricity only came recently) and a hatch to put food through. He asks me to keep doors closed – swallows have a habit of flying in. Harold, who is 86, has followed the same monastic routine for more than half his life, singing plainchant and reciting prayers in a church seven times a day. His approach is described as semi-eremitical – that is, he is somewhat a hermit, but not a full recluse. He has guests fairly regularly. He gets driven by a friend to the shops. Although he may go for weeks without seeing anyone, he has a mobile phone. His singular achievement is not solitude, but the place itself, and his decades-long dedication to praying in it alone. Harold is, I think, a little uneasy about his journalist visitor. ‘I don’t know what you are going to make of all this,’ he says. His place is certainly more sociable than I had imagined. Just as we sit down for tea, an Anglican bishop and his wife pop in with cake. Another man, Frank, also appears at the door – he has come to walk his dog. There’s a paradox to Harold: he is a hermit who is happy to talk to the media. But there is a good reason for that. He doesn’t actually want to be on his own. His hope, he says, is that a little monastic community will start up here: a skete, as he calls it, similar to the small groups on Mount Athos, the holy mountain of Greek Orthodoxy. For most of Christian history, the tradition of the hermit was central. The earliest known examples went off to the desert in Egypt in the 3rd century. In Northumberland, Brother Harold’s part of the world, the practice began with the arrival of Christianity, with two 7th-century Celtic bishops, St Aidan and St Cuthbert, seeking total seclusion on the Farne Islands. Harold started off as an Anglican friar. His order, the Society of St Francis, allowed him to set up a hermitage on his own, as long as he paid for his upkeep himself. He worked in ‘dogsbody jobs’ in a hospital in London before starting life on the hill. ‘The wonderful thing was they just let me get on with it,’ he says. He describes it as falling out of a cardboard box marked ‘Society of St Francis’ and into an Alice in Wonderland-type rabbit hole. He had already toured monasteries and hermitages in Europe but felt he needed a better understanding of what he was doing: he stayed as a sort of intern at Quarr Abbey, a Benedictine monastery on the Isle of Wight. He went to conferences – including, if you can believe it, a conference for hermits. Winters were bleak. One attempt to keep warm, surrounding his caravan with hay bales, only attracted rats. His chapel was a lean-to against an old ruined wall. It had a tin roof and there were pools of water inside. The wind could be fierce: one winter it blew away his garage. Harold doesn’t dwell on the hardship. He recalls cycling to the archdeacon in the nearby village of Eglingham, where he’d walk the dog in exchange for a bath. His monastic life has developed as it’s gone on, he says. His prayers are a mix of Anglican, Catholic and Orthodox. (He became a Catholic in the 1990s, but still uses the Anglican Book of Common Prayer.) The plainchant is partly his own creation – he has translated a vast amount of medieval Latin chant into English, all on the backs of envelopes. It is a remarkable endeavour. Its legacy is uncertain, though. There is a risk he may lose what he has started. We chat for an hour or so and then it is time for Evensong. Harold rings a large bell in a wooden bell tower and another visitor appears – a young Episcopalian priest, bearded and barefoot. He helps Harold in the liturgy, reciting prayers and doing a reading. In between the chanting, I can hear the sheep bleating outside. It is a little chilly, and Harold is wearing a woolly hat with earflaps. I look closer, and realise it has a Thomas the Tank Engine logo. Harold explains, gleefully, that he found it in a car park many years ago. ‘It has become part of the place,’ he says. After Evensong, Harold suggests we visit a nearby church that inspired his own. The church, at Old Bewick, dates back to the 12th century, but Victorians restored it and gave it a new roof. To me, it seems a bit dark and not half as magical as Harold’s. As we drive back, we pass Harold’s postbox at the bottom of the hill. He recalls graffiti left there after he converted to Catholicism: a sign saying ‘Warning: bull in field’ became ‘Warning: papal bull in field’. ‘I’m the papal bull,’ he says. Harold prepares dinner – a meal of ham, cheese, bread and cold baked beans. A final office, Compline, is at 8pm. Then it’s the Great Silence: I go to my cell and watch the sunset, accompanied by a fat rabbit munching grass outside my window.